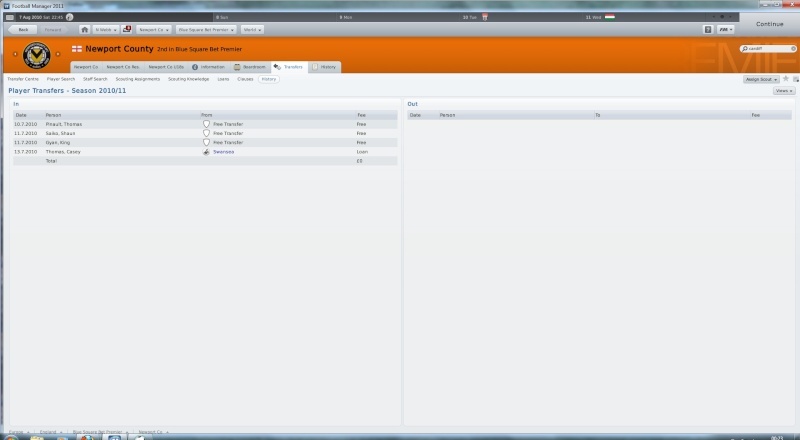 So here we go, i am trying to prove myself as a manager once and for all. Here is the chance to take a team from the bottom to the top, or to make a name for myself and make the bigger clubs notice me. 12k to spend, not much really but i wasnt even thinking about this, loans and free transfers were in order for this club. 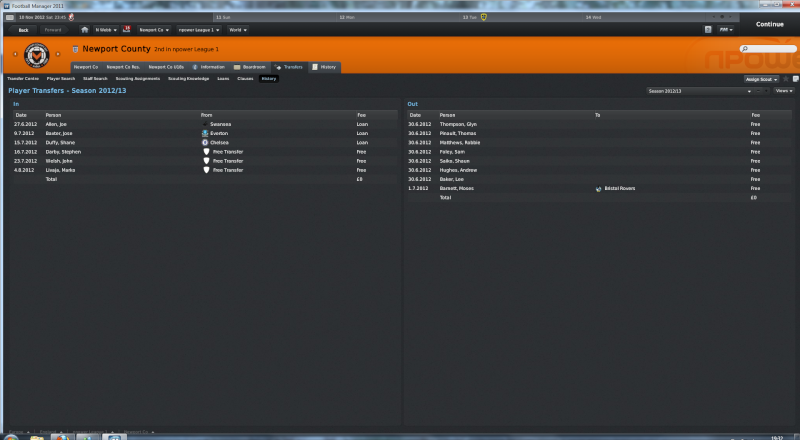 Sadly Newport County are only a Semi Pro team so i dont have alot of staff to help me. With only 9 members of staff which included only 1 Scout finding players was always going to be hard. This is also the current squad. 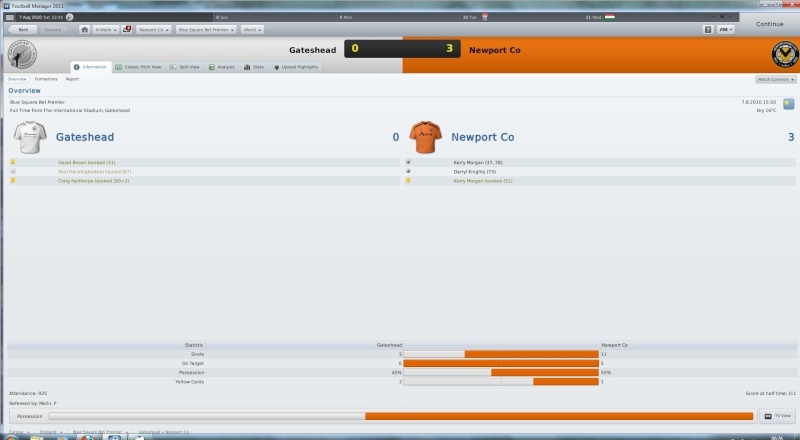 First game of the season comes up against Gateshead, a chance to prove myself show that i have what it takes to take Newport County to promotion. Thankfully the players all done amazingly well for me, and we came out with a 3-0 win. Good luck with this, nikos. I've a particular interest in Newport as my sister-in-law lives there and we spend a lot of time there.They're doing well in real life, so you've got a job on improving on that. Don't suppose you remember them in the Football League do you? Excellent stuff, can Europe be far away for them ? Nah i dont remmember them in the football league sadly, but i have seen them a few times with my Uncle as hes from Newport. 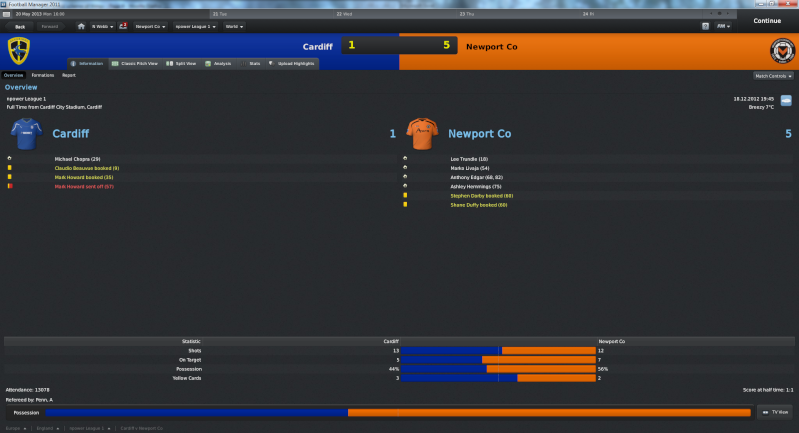 Newport County riding on a high and going well with a 3-0 win in there first game. Kerry Morgan was going to be the front man this season the best player in the team by quite a distance. another 3-0 win and a hat ric for Kerry Morgan. This was followed up by a 2-0 and another 3-0 victory. 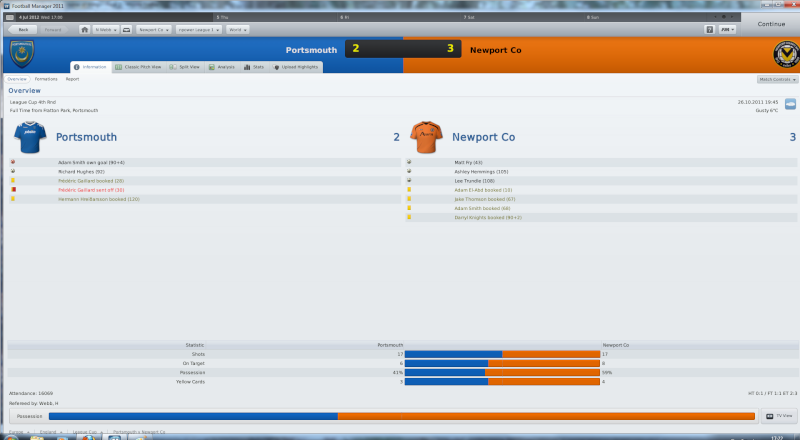 Things were going great and Newport looked unstopable. Looking at the league Newport were now second only to Luton who were firing in goal for fun. But sadly this didnt last after the next game ended in a 1-0 loss. This was quickly turned around by a 3-2 victory Kerry morgan back on form. Next game we had Kerry Morgan out on international Duty which was a real problem. The game eneded in a 4-3 loss. This was followed up with a 0-0 draw. Then a great run came along with one 4-0 win and three 4-1 wins but this was never going to last after and this would be Kerry Morgans last goal in a while. he had a good record though 15 goals in 7 games in the league. Ever without his goals Cassey Thomas stepped up to the mark and gave us a 4-2 win which was followed up by a 1 - 0 victory. But this is where it all turned wrong. A Hammering by Crawley 4-2, then a 0-0 draw with Southport, followed by another hammering at York 3-0. Fa cup came in to break this up thank god and an impressive 4-1 victory. But back to the league and two draws in a row which put the pressure on us 13 points behind Luton and not looking like we were going to turn this around. Along came the FA cup first round with a nice 2-0 win over Eastbourne. This kicked everything off again with three straight wins in the league. Then Plymouth in the FA cup Second round this was hailed the biggest game in the clubs history for a very long time. We were getting back to top Kerry Morgan had started to score again and him and Cassey Thomas were banging in the goals. Jeez! What a game there man! What a goddam result!!! Great stuff so far Nik! Great results, and an excellent update. WOW! What a start mate, bet you were loving that game against Plymouth! Did they play their juniors or something? Keep it up mate, just had a read through and it's a great start. The final part of the season coming up. The rest of the season was a giant rollercoaster. After our amazing 13 -0 win at Plymouth, we went straight back to the league and had a boring 0-0 draw. This was the last game for Kerry Morgan sadly my best player was recalled by Swansea after an impressive 22 goals in 28 games. With Morgan gone Thomas had to step up as my striker but in the next two victory it was Knighty who managed to get two hat rics in those games. after this we lost another game which hit us into top form with two 5-0 wins in a row. The league was going really well we were top all the way up to the 42nd game. This is where he got interesting we were top but if we lost one game we could be down to 6th. This was our worst run of results for a while with 2 losses and 2 draws with only 1 win, this still managed to leave us joint top with Rushden and Wimbledon. The last game of the season was a real walk over against Atrincham with a 4-1 win thankfully Rushden and Wimbledon both messed up. 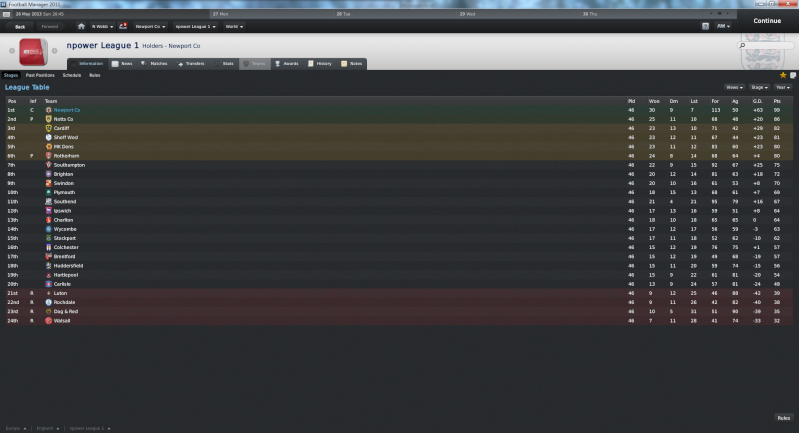 So at the end of the season we won the league and got promoted to League 2. An amazing achievement with Newport into the football league. Even though i won the league and this was a great achievement, my efforts in the FA cup was just as impressive to me, After the Plymouth match we faced Mansfield and beat them 3-2. In the 4th round we were drawn against Hull and managed to overcome them in a 2-1 victory with a late goal. In the quarter finals we were drawn against Tottenham at home could this giant killing run go on.. Sadly no we lost 3-2 to them But an amazing effort by the full team. Even though we didnt win the FA cup to some surprise we did manage to get a trip to Wembely at the end of the season in the FA Trophy this resulted in a 2-0 win against Wimbledon which saw us finish the season Champions of the BSB and winners of the FA Trophey. Hope your first season back in the Football League is as successful as your first season in charge. Love the 13-0 scoreline !!!! So with our first season in League 2, i was given a massive 750k to spend which is alot for this league and alot for me to try and spend but a whole new team was in order to get promoted this season. The board wanted me to fight relegation this season, but i think i can do better so here we go. 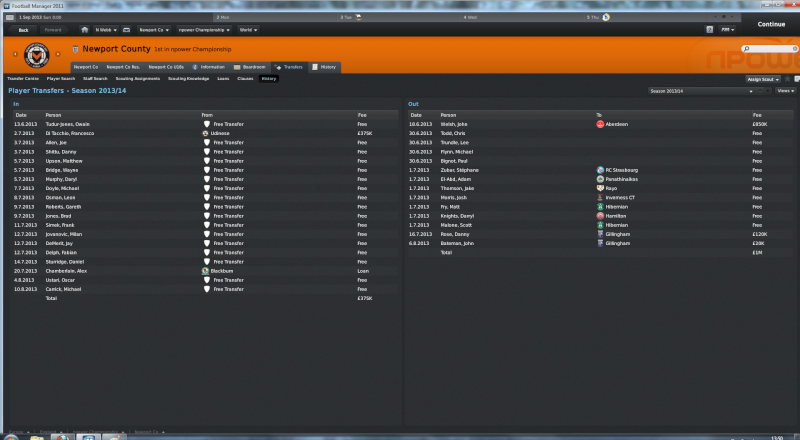 These are the transfers for the season spending a create 14k out of the 750k i was given. These players were all 5 star ratings and could all play for a championship club according to my scout, alot of work was put into getting these players so the hope was there to get promoted. 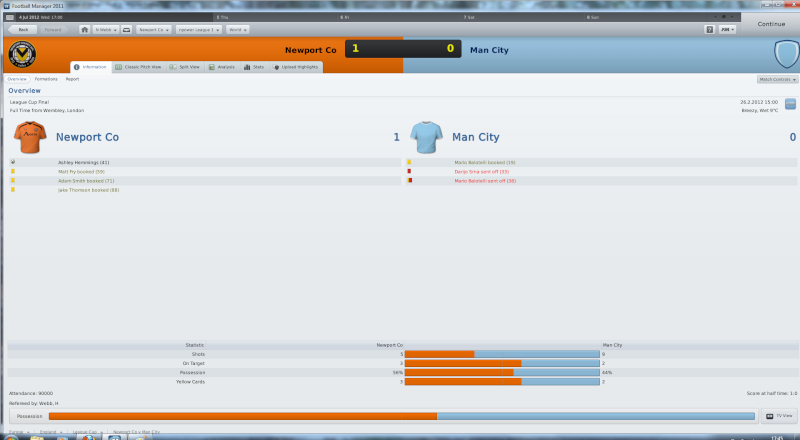 First game of the season and we were off to a flyer, with a 5-1 over Crewe at home. 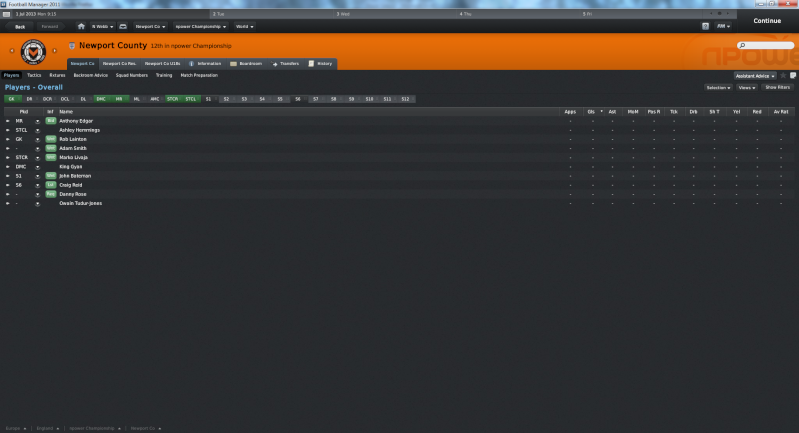 The league went from strength to strength with a 2 - 0 win and a 1 - 0 win other Macclesfield and Bradford. 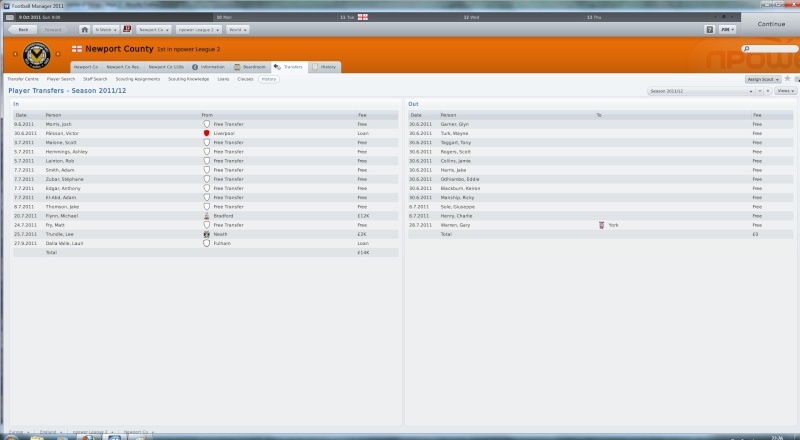 This point i thought i had created an amazing team and we could go on to win the title and gain back to back promotions. My thoughts have not changed now as we are 11 games into the league and we have won all 11 games with some ease. Scoring 32 goals and only conceding 7 goals. First year in this comp for me and Brentford away always going to be a hard game, but my team was strong and i knew we could over come them. So we did with a 2-0 win. 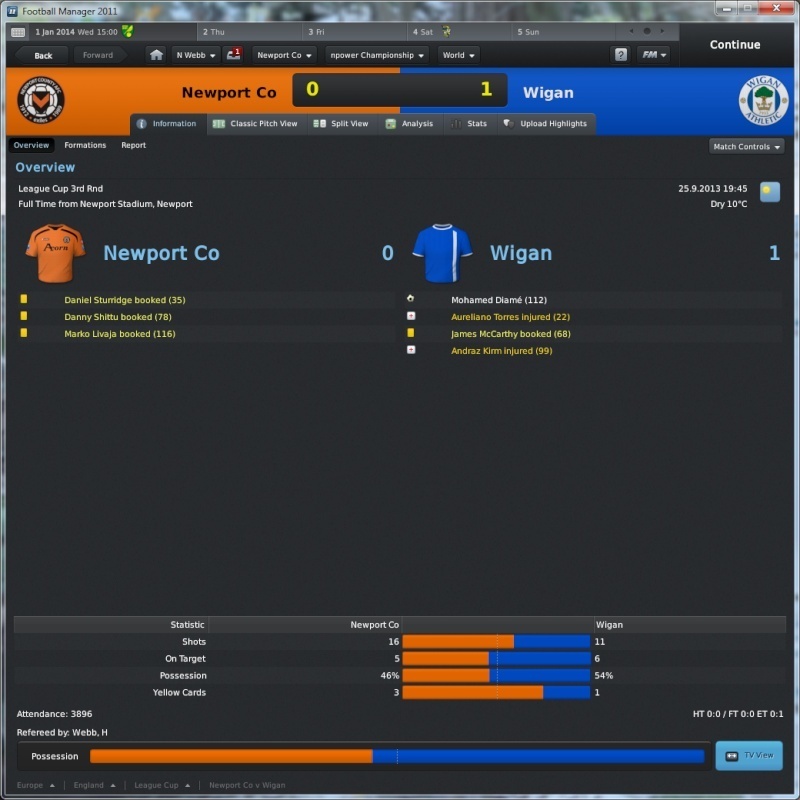 Second round and we were drawn against now championship side Wigan, they have lost alot of there players since being relagated and this was shown when we went out against them at home and walked all over them to come out with a 3-0 win. Third round now and a harder team in Shef Utd this was a harder match, with a 2-1 victory well fought by my team and deserved winners. Round 1 drew us against Bournemouth which we managed to overcome quite easily with only a 1-0 win but not letting them see the ball. Round 2 was against Aldershot with half of my team injured or travelling this was a harder match which saw us losing 4-2 on penaltys after a 1-1 draw in normal time. 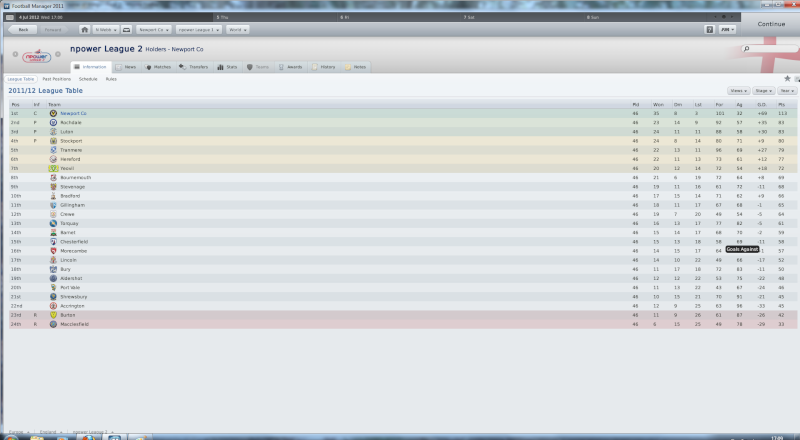 So here we go with one of the best seasons ive ever had in my life on any FM game. The league was really quite easy this season, walking past most clubs quite easily. 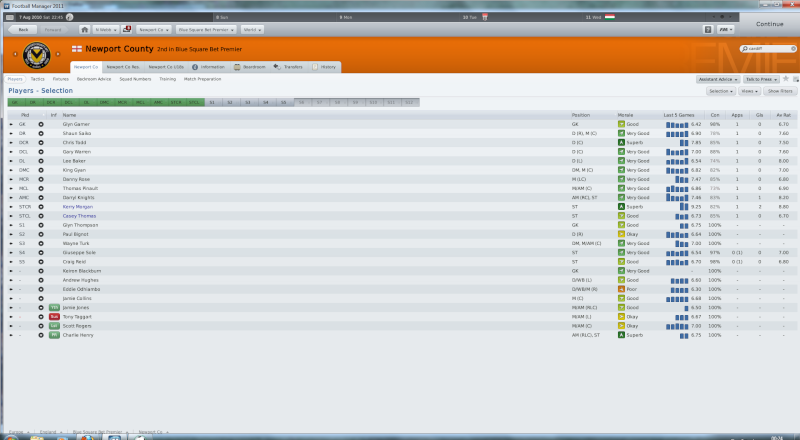 Proving that i have built quite a remarkable squad through free transfers. It took until the 15th of November to drop any points in the league at all, this meant we had an 11 game winning streak until our 1-1 draw with Rochdale. After this the team did not lower there heads at all and carryed on the winning streak to another 4 games, in this time there was an amazing cup run going on. 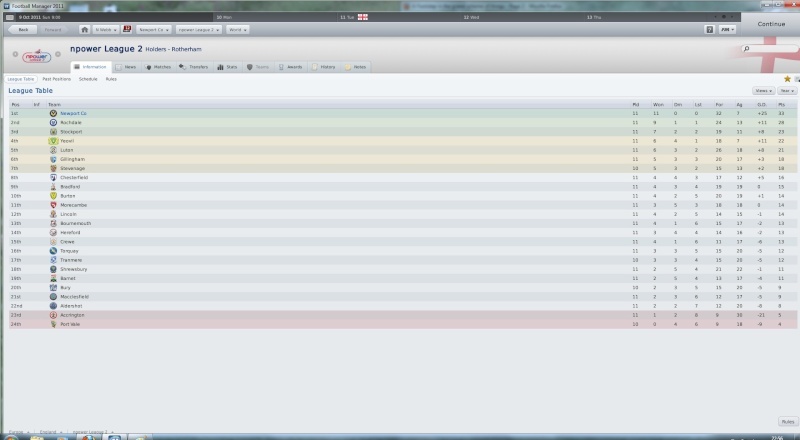 we had a 16 game unbeaten run which put us quite far in front in the league. Our run came to an end against Stockport in a 1-0 loss away from home. The team didnt let there heads down drop though and carried on another unbeaten streak which lasted 8 games with one draw and 7 wins. After this we lost 1-0 to Bradford and drew our next two games, this would have been worrying but at this time we were 15 points clear at the top of the league. We came out of this little rut with a 2-0 win over Aldershot. but this was followed up by another draw. 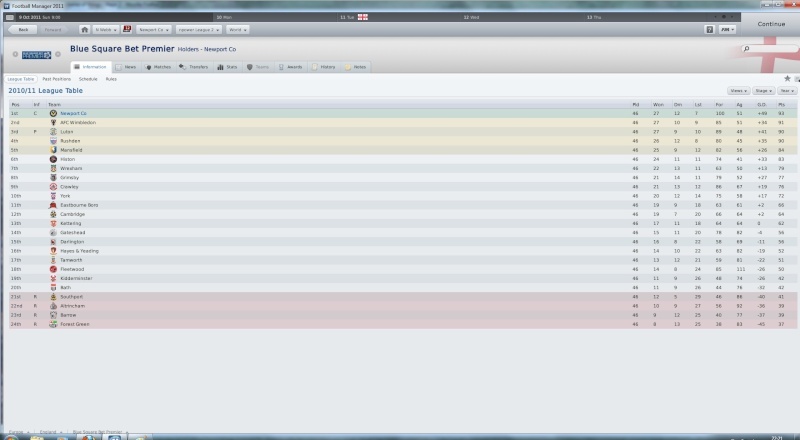 After this we went on a winning run of 5 games which came to an end when we lost 5-4 away at burton. In this match we were 4-1 down at half time so it was a really good team effort by the team. 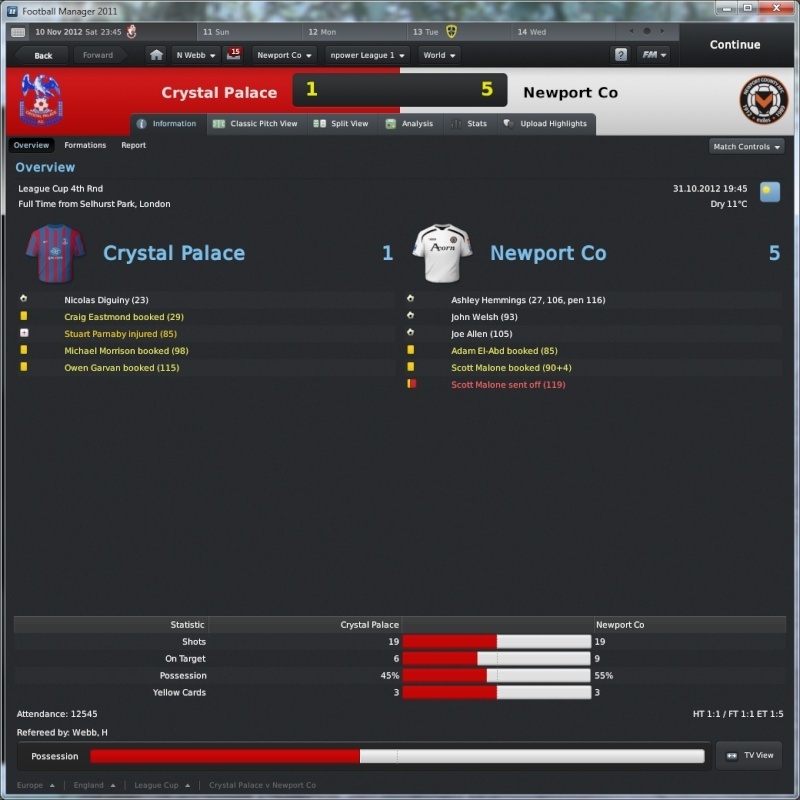 After this we went on to win two more games, then drew 2-2 but after this 2-2 draw we were made champions of League 2 and there it was up to League 1 back to back promotions from Newport a brilliant achievement. 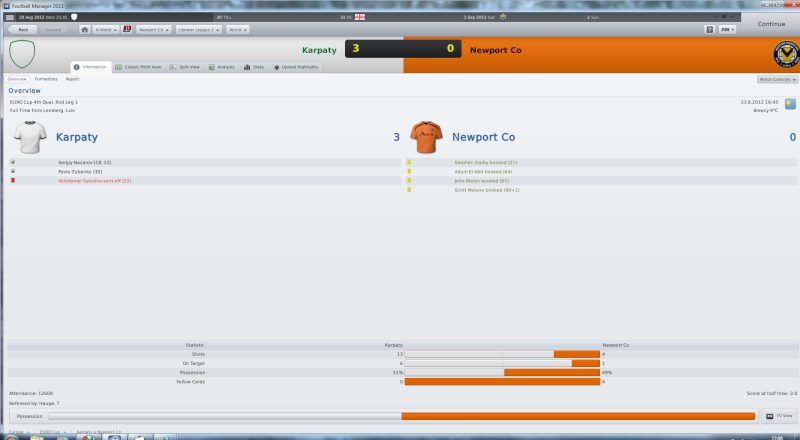 The league finished in with Newport on 113 points, won 35 games, drew 8 games and lost only 3. We scored 101 goals and only conceded 32 in the league. Ashley Hemmings was the man of the of season with 24 goals and 9 assists in only 36 matches in the league. In the first round we played Stevenage, we drew 2-2 in the first game, when the return leg came around we only just managed to get through with a win on penaltys 3-1. The second round put us up against Darlington, which was a simple 3-2 win. The third round was was against Man City, this match i was hopfull of getting through as i thought they would play a weak squad but they didnt, it was full strength but we only managed to lose 2-0. I was very proud of my squad after this match. This was my tournment for the year, the bigger clubs play weakened teams and the smaller teams could be a challenge but i had confidence in my team. The quarter finals and finally something which would give me alot of Money, Manchester United at home. We went straight on the counter attack and defended our hearts out to try and get something from this game against a weakened Man Utd team, there only first team players were Valencia, Giggs, Park, Vidic and Vertonghem the rest were kids and soon tierd out as soon as this happened i new we could start to attack But as soon as we done this Park ran the full length of the pitch passing my players with ease and scored a wonderful goal. Again we went all out attack to try and get something and again Matt Fry came up big to make it 1-1, nothing else happened in this match so it went to Penalties. Which amazingly we won 3-1 again The giant killing run goes on. Semi Finals two legs and up against Chelsea. This was going to bring in alot of money for us. The first leg was away at Stanford Bridge. Chelsea played a very very young team against me so i thought they were underestimating my team, but it was the other way round i did not realise how good Chelseas youngsters were they ended up beating me 4-1 The first team players were Bosingwa, Mikel, Anelka, Pienaar and Zhirkov. With such an amazing run getting to the final quite unbeliveable really and the fact we could be in Europe, and also be in League 1, it goes to show you can beat anyone on your day, mainly when they play youngsters against you. Man City in the final the big spenders, already knocking us out of the FA Cup and one team that take all comps seriously so no kids on show for them. We started the game out in a defencive formation, just playing counter attacive football. we were containing them very well, keeping it 0-0 until the half hour mark, when we had a break away with hemmings through for a one on one chance, when Srna comes accross and takes him out around the D, he was soon dismissed Man City down to 10 men, then came the next miricle, Balotteli picks up a second yellow card and also gets sent off, which left them down to 9 men, we stayed in a counter attacking formation, i thought if we held on until the 80th minute we could then start attacking more, but Hemmings broke away again and won a corner, up came my goal scoring defender Fry, yet again he meets the ball and sends us 1-0 up. From this we carried on attacking, they were down to 9 men a goal just before half time, must have ruined there confidence as well. We managed to hold on to the final whistle. WE HAD WON THE CUP amazingly we would be in Europe next season. Niko, I think I speak on behalf of everyone when I say " COME ON NEWPORT!" You'll get into the group stages with ease! sorry, Niko, I haven't really kept up with this. But just read the summary of your first league season. 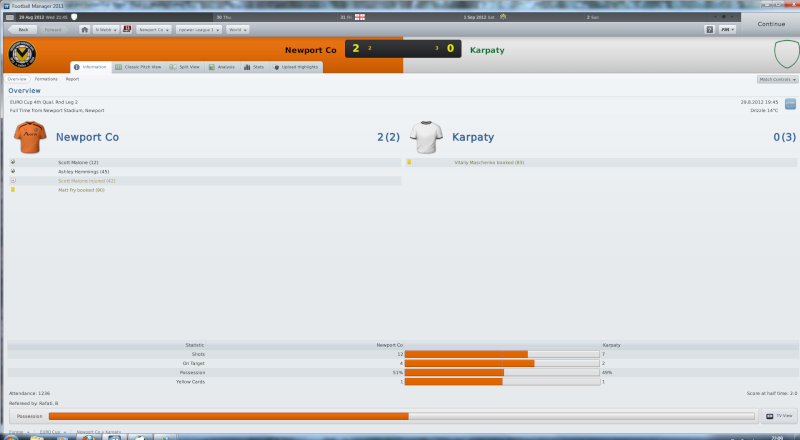 Second leg was alot better with a 2-0 win very very unlucky to lose, hitting the post at least 4 times. Unlucky mate, was quite close in the end. So this season we were in the Europa League for doing the impossible and winning the Europa League. Thats already been posted in this thread so i wont repost them. We had to bring in some quality players for the Europa league, Sadly i failed with this as i didnt want to spend any money. We went into league one full of confidence and this showed with an amazing 4-1 win over Dag & Red, but we were soon brought down to earth by Rotherman away from home losing a cracking 3-2, which saw the lead of the match change three times. Southend was right in the middle of the Europa league matches, a weakened team went out to play in this match and they came back with a 1-0 win . We then travelled to stockport where we drew 1-1, the next watch was home to Charlton where we won 3-0 quite easily against a team i was worried about. We then travelled to Carlisle and lost 2-1. So far our away form is really letting us down with one 1 point from 3 games away thankfully our home form is 3 out of 3 so far . Next up was Luton at home an easy 4-0 win here. This was followed up by an amazing away win, we finally went out and won away from home in a 4-1 win, this good news could only backfire and it did with a 5-2 loss at home to Southampton, a really upsetting result with no one performing at all. We then went up against Colchester away winning 2-1 and followed this up with a 3-0 win at home against league leaders Sheff Wed, Rochdale were our next victiems a 4-1 away win here, Huddersfield then came to us and they were defeated 4-0. This run had to come to an end soon and it did with a 2-3 loss to Plymouth. Hartlepool next and a chance for us to come back into winning ways, a very poor 1-0 win, he had the result but in truth we should never have one the game. Were doing better than last year already in this comp already by winning a game, against Southend 2-1 this has made for an interesting match against one of our rivals Cardiff City which is the next game. Our 3rd round match was up against Tranmere, where we won 4-1 in quite an easy fasion really. The 4th round match was a very thrilling one but i will show you this match instead. Thats where i am up to at the momment. You could well end up retaining your league cup you know! Incredible work so far mate. class stuff! Spurs away and there unbeaten in the Prem League so far, hopfully i can pull off a miracle but im kind of hoping to go out as i have a tough battle to get promoted. Well end of the season has come, taken me a very long time to get there but hey. so we left this off at a trip to Spurs in the league cup, everything was going well in this match until Zuber got sent off after that Spurs completely dominated us and we ended up losing 2-1 and out of the league cup, sadly we could not defend it. But onto the league where promotion was all we cared about. The next two games against Gillingham and MK dons went down to plan with two easy wins. but up against brighton was a real hard game away from home. We ended up losing 2-1 which was flattering in truth we should have lost by 8 or 9. 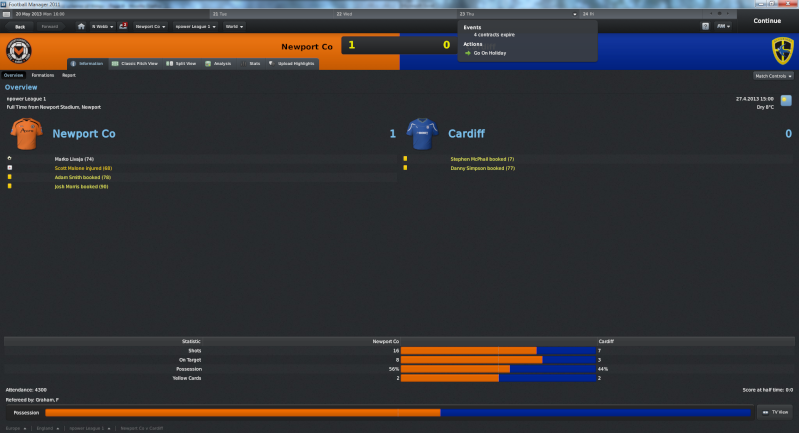 But we had to bounce back quickly as we had a game away at our local rivals Cardiff City. A lovely 5-1 win and a great match to watch for my supporters. We managed to follow that win up with another at home against Ipswich, but then a draw against Notts County our biggest rivals in the league so far and a loss to Dag and Red brought us back to earth showing this league is a lot harder than last years. but we came back from this and managed to beat Stockport at home 3-0. Our up and down form continued with two draws in a row. We then picked things back up with a 4-1 win against Charlton away from home. we back this up with 7 more wins to put us right back up the league top spot ahead of Notts County and Cardiff by 2 points now. This impressive run came to and end when we played sheff wed away from home was a narrow 3-2 loss. thankfully we came back and didnt let our heads drop with a 3-1 win at home against Rochdale. Then we draw another two games in a row against Huddersfield and Plymouth. This put us in third place behind Cardiff and Notts County. We now had two games in hand but we were 5 points behind. Our next two games were both wins against Hartlepool and Swindon this took us within two points with one game in hand. The game in hand was against Wycombe but sadly we could not take advantage of this by drawing 1-1. Next up was Bury which was a wonderful 2-0 win but then two draws against Brentford and MK dons were disappointing results but thankfully Notts County and Cardiff were in bad form both a number of games in a row. We were now top. Brighton up next and this was an easy 3-1 win. Which put us in an amazing position in the league and a wonderful opportunity in our next game. Thats it we are champions and onto the Championship we go. The last two games of the season were against Ipswich and Notts county. 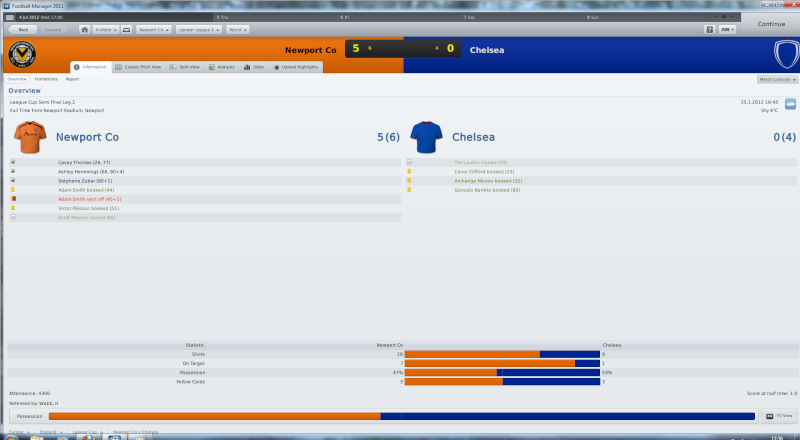 Ipswich ended 1-0 but Notts County were demolished by Newport in an amazing 5-0 win. We were entered into the 2nd round of the FA cup this year and we were up against Gillingham away from home we only managed a draw here and had to take it to a reply this was a narrow 3-2 win after extra time. 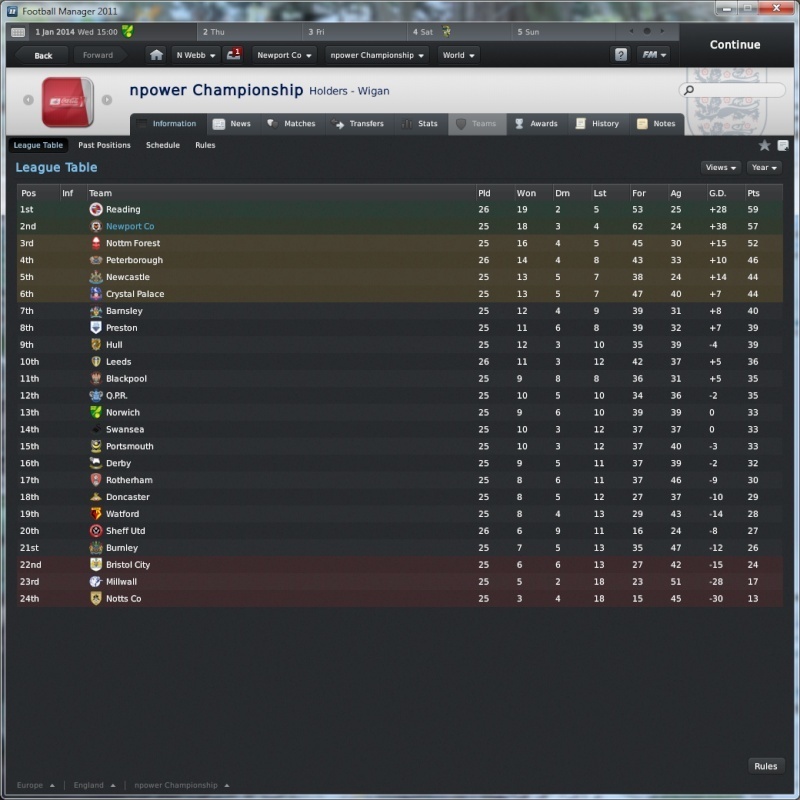 Gillingham were a really hard challenge but thankfully we got through. 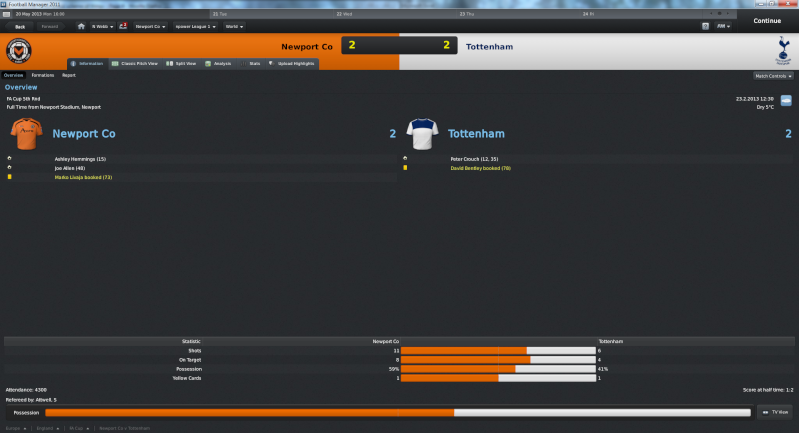 The third round we were up against Milwall. We were at home for this match and after a very eventful game we managed to get a draw 3-3 at the final whitle. And we had another reply this time we made light work of Milwall with a 3-1 win. Underdogs move on. In the 4th round we were up against Bury and as you would expect we walked past them in a 3-0 win. So yet another reply this time to White Heart Lane to try and cause a major upset.. So the Trophy i actually wanted to win this season was the league cup but being out of that, this was our next best bet. Brighton away and my team went out showing flair and 110% work effort and came home with a 6-0 win. Wow great season! Excellent and keep it up! But in all seriousness, well flippin' done mate! I can't wait for you to tear the Championship apart! Wow Niko great job, can't wait for next season! I can see great things coming in the Championship! At least moving up may just bring up some interest in the transfer market, right? I have faith, you can do it Niko! So after only having 10 players i needed to rebuild and fast, but before this i had another two players leave down to recieving the right price for them. So down to 8 players we went. Some amazing transfers have come in i feel and i think i can now get promotion or challenge for the play offs i am still favorites to go down though. A big step up again this year another challenge and a new squad. The Opening day was against Norwich away from home, i was named underdogs like i proberly will be all season, but i have a lot of talent in my team and i think people underestimating us will be key this season. This was the case against Norwich they came out all out attack but we easily stole the ball off them and got it up there end of the pitch time after time, the pace and passing were too much for Norwich as they had two men sent off by the 70th minute down to late tackles. Before this though we were already 2 - 0 up, once they went down to 9 men we went all out attack and managed to win the game 3 - 0 i left this game was only things to come. In the second half we came out with a new found purpose, with Hemmings back from injury and after countless attacks being saved or chases being wasted we ended up breaking through with Livaja who was taken out by Vahirua who was already on a yellow yet the ref didnt send him off even with all the cries for him to go. But Livaja stepped up and smashed it home, sadly we couldnt break through again and drew 2-2. We then had our first home game of the season against Barnsley. After 4 minutes we were 2-0 up with goals from Sturridge and Livaja. We were in complete control and never looked likely to lose this one, this was made even stronger with Livaja adding another on the half hour mark and then after half time adding his hatrick for 4-0. Sadly our defence let there heads down conceding a goal in the 89th minute but a 4-1 win at the end of the day. To end the month in the league we welcomed Sheff Utd to our ground, a second string squad had to be played after a tough League cup match just before but my team were always looking the better team, with goals from Adam Edgar and Owian Tudor Jones to give us a 2-0 win and looking very strong in the championship so far. This year we were up against Barnet in the 1st round of the cup away from home we wanted a nice easy win to get us though to the next round, and after 3minutes Livaja scored to make it 1-0 i thought we were going to walk all over them from then. 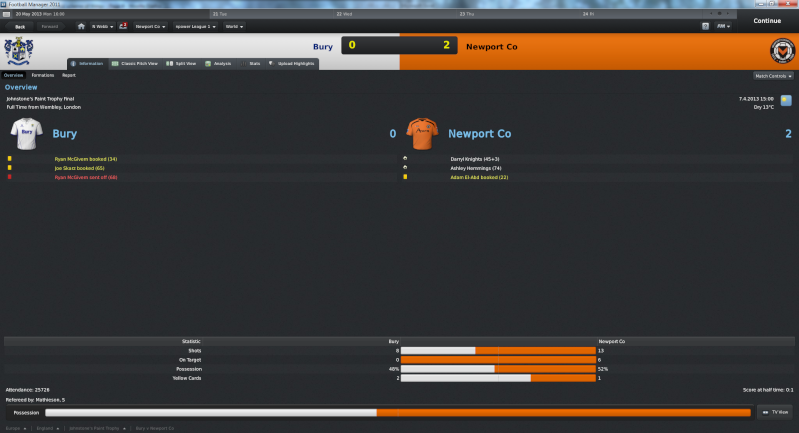 Barnet put up a big fight though and only because of heroics from Ustari we managed to scrape through 1-0. Up against Premiership side Middlesbrough at home. This was a real test of our side now see how far they have come, and at home we took the game to Boro who couldnt cope with our quick slick play and were stuck in there own half for the majority of the first half, Sadly we could not make a break through though. Late in the second half our break through finally came from Livaja who has really stepped up this season so far, Sturridge then smashed in a second to send us sailing through to the Third round where we will play Wigan. Your signings are fantastic, Carrick and Bridge on free transfers! Flip! Well done in the league so far mate, you're doing great, can't wait to see how you do! The road to the big leagues is on course! Incredible stuff mate, transfers were cracking! Great job with the transfers! Carrick and Bridge especially! We kicked off September against Derby away from home, we are still yet to win a league game away from home and sadly this was not going to change here after 15minutes we found our selves 3-0down, which was never good, so i made two changes then to make the defence stronger which seemed to be working until the hour mark where we conceded a forth 4-0 down. Then my team started playing but a little too late, we did get two back but ended up losing 4-2. Rotherham at home next, an easy one for us i felt and a 4-0 win showed that my feelings were correct. Leeds at home next and a 5-0 win showed me that it was just away from home we were struggling so a change was needed i felt. A stronger defencive tactic was tryed out against Milwall away and this worked very will with a 3-0 win. So i tryed the same tactic out against Swansea away and we managed to pull off a 4-2 win from being 2-0 down at half time. Things were looking up for us away from home. So when we had Preston pay us a visit i was in an upbeat mood and this was made even better by an early goal but sadly we sat back and in the 90th minute they got a goal to make it 1-1. So up comes Nottm Forest for us to show the draw was a blip. At home in a very good game. we went 1-0 down after four minutes but got a goal back to make it 1-1 then we ended up conceding two quick goals to find ourselves 3-1 down, a quick goal from the restart made it 3-2 going into the break what a game so far. I thought we would come up all gun blazing the second half which we did but Nottingham Forest played the counter play very well to make it 4-2 to save abit of face we got a late goal to finish the match in a 3-4 loss. Next up was an away trip to newcastle which would never be easy but we played out a bore 0-0 draw. Three games without a win now so Peterborough at home was a welcoming site, an easish game which we dominated start to finish to make it 4-1. We backed this up with an away win at Hull. Things were looking up a home game against Doncaster was won which should have carryed on our winning streak but a penalty cost us the game losing 1-0. My team were obviously annoyed by the penalty as they came out full of mence against Watford winning 4-0 away from home, and backing this up with two 3-0 wins at home against Reading and Portsmouth. An away game against Bristol and a home game against Blackpool both finishing in 2-1 wins and an away trip to Crystal palace ending in a 3-2 win but us back in a great positon in the league. The final three games of the year were against Notts county at home which was a 1-0 win, Burnley at home which was a 2-1 win and Barnsley away from home which was a 3-0 win so a lovely run of 9 straight wins in the league carrys on into the new year. So my worst run in the League cup todate. A bitter loss i must say but its allowed my team to play for promotion instead.